A positive and enthusiastic mentor, Melanie has developed a loyal following of students over the past ten years. She instills a sense of independence and desire for experimentation, allowing them to discover their artistic voice. Individuals are encouraged to work on their own material, at their pace and in any medium: watercolour, acrylic, oils and mixed media. Occasionally, the class will work on an assigned project, experimenting with new methods, materials or techniques. She stretches her students beyond their comfort zones in a fun and supportive atmosphere shaking things up with demonstrations, mini workshops, gallery tours and plein-air adventures. She ends the season with a group art show. Melanie is a certified GOLDEN Artist Educator. Join Melanie in this one day exploration of the beautifully saturated colours of acrylic inks. You will be working on a flat surface; dripping, pouring, spraying, brushing and scratching into the surface. We will play with texture by adding GOLDEN Acrylic gels, pastes, paint and collage, working on many paintings at once. 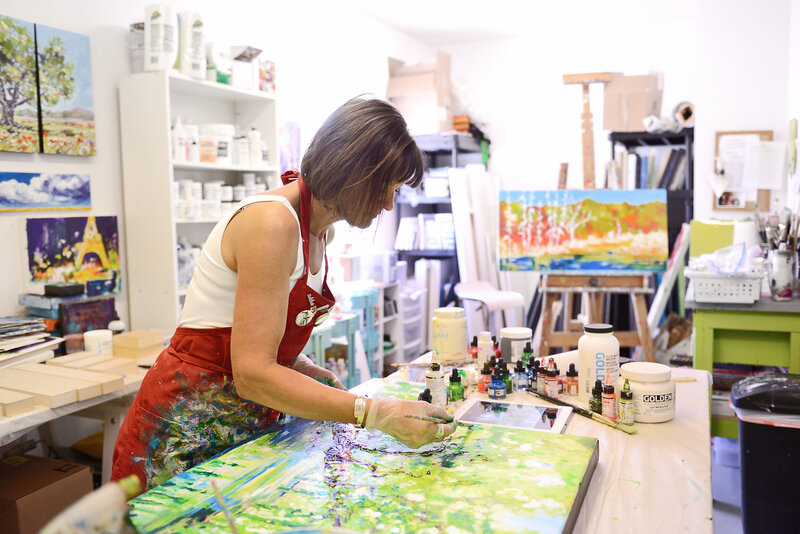 Join Melanie in this one day exploration of the beautifully saturated colours of acrylic inks. You will be working on a flat surface; dripping, pouring, spraying, brushing and scratching into the surface. We will play with texture by adding acrylic mediums and paint, working on a few canvasses at once. This fun process will inspire new ideas for adding zest to your paintings. Level of experience recommended is Beginner with some painting experience, Intermediate and Advanced. Bring several references to work from. Melanie will be demoing florals in various stages of development. Join Melanie in this one day exploration of the beautifully saturated colours of acrylic inks. You will be working on a flat surface; dripping, pouring, spraying, brushing and scratching into the surface. We will play with texture by adding acrylic mediums and paint, working on a few canvasses at once. This fun process will inspire new ideas for adding zest to your paintings. Level of experience recommended is Beginner with some painting experience, Intermediate and Advanced. Bring several references to work from. Melanie will be landscapes in various stages of development.